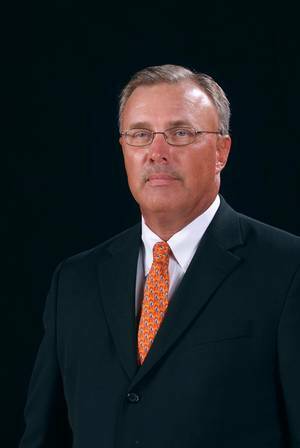 Friday morning, Oklahoma State associate head coach Jim Littell had to make a heartbreaking announcement to the Cowgirls about coach Kurt Budke and assistant Miranda Serna, who were killed in a plane crash in central Arkansas on Thursday. Littell was assigned the immense task of taking over the Cowgirls as interim coach, forcing him to assume roles of counselor, parent, friend and instructor, all while dealing with his own painful grief. Littell’s coaching resume is impressive. But that isn’t what those who know him say will help him navigate the Cowgirls through this trying time. “He cares so much about the kids he coaches,” said Galen McSpadden, athletic director at Seward County Community College, where Littell had enormous success as head coach during his 14-year run. Tucker Barnard, Stillwater High School‘s football coach who has both of Littell’s sons on his team, doesn’t know Jim Littell the coach. But he does know the man. “His leadership and the relationship he has with kids is going to be really important,” Barnard said. “The high school kids at Stillwater absolutely love him. His house is a really popular hangout for kids on our football team. But beyond that, Littell has to cope with his own pain. His relationship with Budke has been described as brotherly. Budke hired Littell away from Seward County, which he turned into a junior-college power. He posted a 418-61 record, nine conference titles and the 2002 national championship, the school’s only national title in any sport. Perhaps most impressive, though, was his home record. Between 1995 and 2004, Littell’s Saints won 135 straight games at home. Littell, who was inducted into the National Junior College Athletic Association Hall of Fame in 1999, got his start in 1978 at Kansas‘ Oxford High School. Littell’s Oxford team won the 1981 Class 2A state championship. But Littell’s success on the court isn’t why he is the perfect person to take over after such a tragedy, his friends say. It is his character and his connection with Oklahoma State. “There’s not a better person,” said McSpadden, who hired Littell at Seward County in 1991. OSU president Burns Hargis said he didn’t require Littell to be at Friday morning’s press conference; Littell wanted to be there. He fought through his statement Friday, describing Budke’s love for Oklahoma State. “Every day we would bring a recruit in, he would walk them on the court and say ‘Look at this place. Look at this place. I love this place,’” Littell said with his arms raised. “And he meant it from the heart. Littell loves the university and his players, too. “No other coach coming in would know how to treat those kids better than Jim,” said Washington girls basketball coach Rocky Clarke, who has known Littell for many years.